Radiator Blog: "You sleep rather soundly for a murderer": on murder systems and destabilizing virtual societies. "You sleep rather soundly for a murderer": on murder systems and destabilizing virtual societies. During an Elder Scrolls game, you will likely kill thousands of things. However, all of those killings are sanctioned by the NPCs in the game: you are killing monsters outside of cities and villages. Their deaths don't matter -- more will respawn to take their place, or maybe the game will delete them to free-up memory when you wander away far enough. They exist only to be killed. They are domesticated and farmed. The Dark Brotherhood questlines in Elder Scrolls games, then, are one of the few instances in games that really focus on killing as killing. Specifically, it frames murder as a deeply anti-societal, anti-social, transgressive act, and explores the philosophy required to justify it. At it's best, it's also deeply systemic. 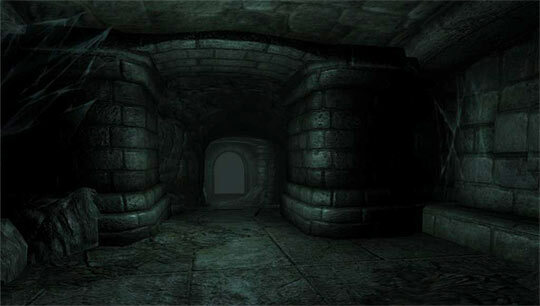 When I first started Oblivion, I left the tutorial dungeon and entered a random dungeon somewhere. After some rat-stomping, I saw a strange silhouette in the distance -- a heavily armored orc. I aimed my bow at its foggy 10 pixel-large head-like thing, and shot it in its probable face. It died. That's when Oblivion told me: "Your killing has been observed by forces unknown..."
WHAT. But why this killing as opposed to the countless other killings I've already committed? Huh? I check the corpse (an orc, so probably a monster, right?) and the tooltip says "Adventurer." I just murdered a friendly NPC under a racist pretense. It wasn't fair! The game never told me that it'd randomly spawn friendly NPCs in dungeons! Then I thought, okay, no one saw me do it, I'll hide the corpse and take its boots... but "forces unknown" saw me! Ah! But then the game woke me up. It woke me up to a creepy crazy man's face, extremely zoomed-in, telling me he knew what I did. 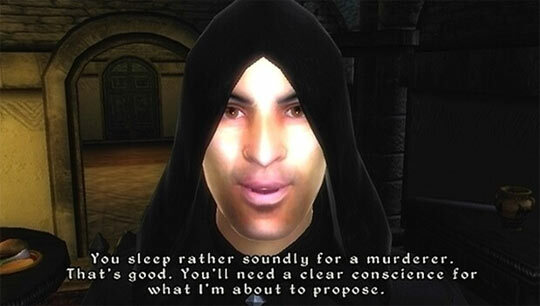 The implication is that this creepy cloaked talking doll could've murdered you in your sleep, much like how you possibly murdered someone else in their sleep, but he chose not to. Of course in reality, the world is totally stacked in your favor, and NPCs are not allowed to attack you whether you're sleeping or "fast forwarding" in the same place for 10 hours at a time, but the menace and creepiness comes across anyway. A murder is "hard" if there are many possible witnesses, or if the target could run and get help. >> Most murder quests take place in cities. The witness procedure is recursive: killing witnesses may create more witnesses, whom you must murder as well. That last consequence is the reason why the procedurally-generated murder quests, in Skyrim, are so pointless -- there, the game generates an NPC target for you to murder. There's no danger or risk in that destabilizing the game. There's no serious transgression. This NPC exists only to be murdered! Again, it becomes an act of farming instead of murdering. But the authored murder quests focus on exploiting your pre-existing relationships to cities and NPCs. Murder transforms killing from a pervasive context to a singular act with dramatic preparation and build-up. Wait until nightfall, when most people are at home or asleep. Observe guards' patrol patterns. Some cities have a "changing of the guard" that leaves the streets defenseless for a brief time. Break into a person's home, hide, and wait for them. Kill them in their sleep. Enrage / frenzy them into attacking some guards or monsters, and getting themselves killed. 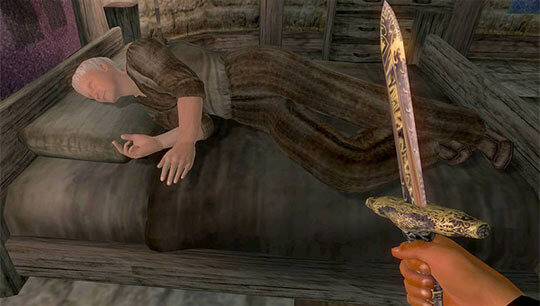 (Oblivion) Leave poisoned apples in their kitchen, remove all other food items. 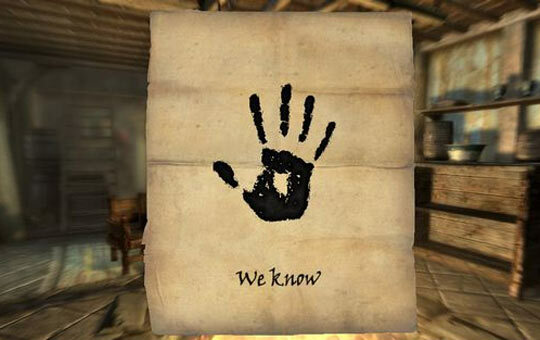 To me, this is what makes murder fascinating in Elder Scrolls games: it is rarely framed as ethical, it often requires manipulating people / observing the pre-existing system, and it hooks into so many systems. Comparatively, murder in Assassin's Creed means flicking a knife and sitting on a bench, and most of the murder in Dishonored takes place in a deserted city where almost all the NPCs "deserve to die," and Hitman missions are in small separate isolated sandboxes. But in Elder Scrolls games, murder is about killing people in inconvenient situations -- people who cannot respawn and who probably don't deserve to die -- and their deaths might have far-reaching consequences that threaten to destabilize the entire game. Like, if you depopulate a town, the system begins ignoring itself. Merchants cannot buy or sell anything because they're dead. Questlines cannot progress because the quest givers are dead. The game, essentially, loses its interactions -- when you kill these NPCs, the game dies too. And really, that's the only real threat that a game can use against a player: given your choices, the game will let you murder the game, or maybe the game is killing itself?